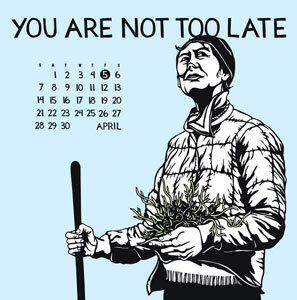 I have Nikki McClure’s brilliant calendar in my room – more for the art and message than the date tracking – and I’m not sure I’m going to ever move on from April’s image, which I can see every morning when I wake up. It’s like the Spirit is just waiting each day to encourage me, which is a kindness I readily welcome. My mind has been full of so many things I want to accomplish and I do feel the life hours burning up quick, but I’m resisting that internal pressure to be stressed and driven. My best work comes out of rest and abundance and I need to stay in that place. ~ You can watch Eco walk through his unbelievable library here. ~ Rebecca Solnit’s letter to children about reading. ~ This beautiful tribute to poet W.S.Merwin and his arborial legacy. I’ve been spending my life trying to become a bad Catholic because I had an innate trust of authority. When the teacher said, “Now you won’t understand what I’ve just said,” I thought, “OK, that has to be true.” And what that teaches me is that it’s important to listen to the intuition, because we might know more than we know we know. I think that’s a deep, trusting relationship we have to have with ourselves. ~ Jo Harjo’s Eagle poem has also been helpful. ~ I’m also meditating on these Liturgists’ podcasts with Richard Rohr . I need to listen about four more times to understand it all and then maybe I’ll read his new book. I need to go at these things slowly now. Well, it’s back to work. I’m taking a break from social media for awhile. You can find my contact info in the header if you need it.